The overall goal of SurgiTrack is to improve access to surgical care and to optimise utilization of surgical resources. SurgiTrack is an integrated surgical workflow system. The project aims to provide a digital platform for managing the problem of waiting time for surgery. Our current implementation is a web-based application that has the following functionalities: booking patients for surgery, managing admission and theatre list, communicate with patients. In addition, the system has a clinical prioritization module that provide decision support to the physician. There exists a worldwide unmet demand for surgical care because of limited resources; namely personnel, equipment and theatre time. The unmet demand results into a waiting time from the moment of diagnosis to surgical operation. Many surgical departments have paper based waiting lists where newly diagnosed patients are added. Other departments use spreadsheets. From these waiting lists, patients are queued and are invited for elective surgery. The management of these waiting list becomes a complex task for the physician and hospital staff. Patients in the waiting lists have to be prioritized to identify those who require relatively urgent surgery. The task of prioritizing patients takes lots of hours that physicians would otherwise use to offer medical attention. In some departments this task takes up to 20% of the physician’s work time. In addition, the physicians must also maintain the principle of distributive justice while considering the next patient for admission. It is therefore not unusual that patients wait unduly too long with high risk medical conditions. Sometimes patients fall through the cracks and only come back to hospital with advanced disease that lead to severe complications. Furthermore, physicians lack an optimal system for communicating with patients waiting for surgery. Sub-optimal communication leads to patient anxiety, wrong admissions, unnecessary emergency hospital visits, tests and patient complications. Ultimately, the overall cost of managing a single episode of illness increases. Besides, there is lack of matching between resource allocation and the profile of patients waiting for surgery. Allocation of surgical resources is based on historical consumption data. 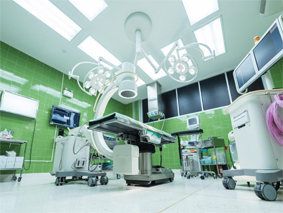 Yet surgical departments should know in advance the specific equipment and personnel required to meet the needs of patients waiting for surgery. It is not unusual that a surgery is cancelled because of lack of specific equipment. The result is loss of theatre time and prolongation of the waiting list. On the contratrary, some theatre units have expired stock of surgical consumables and equipment due to underutilization. This mismatch of resources versus patients is not only uneconomical in resource limited environments but also undermines access to surgical care.